My sumi-e in the drying stage. Technically I don't know if you can call it that if color is used with sumi-e or if it is just black and gradiations of black. Right now these babies are bisquing and we will see how they turn out for the glaze. Sometimes I don't think folks realize how much preparation and time goes into the creation of new work or exploring an idea. Potters definitely are working on the expanded time section of "instant gratification" spectrum. I mean, really, weeks to get to the glazing stage, then not knowing what will happen in the kiln....we must in love with the magic and mystery of letting things go out of our control and become something on their own. Enough pottery philosophy, I have to cut the grass! This is the little family of pierced vases that I was talking about. I have done some impressed texture on the far left one, then slip brushwork with the Blackbird slip. Would like to try feet on all of them, but that would mean coming back and handling the larger ones when they were more stiff. This week has flown by. 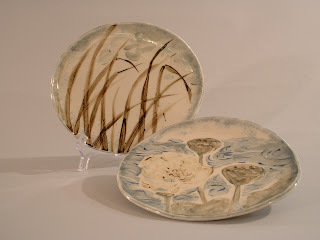 I have been making some dinnerware sets, so it has been a lot of checking, trimming, making more and bisque firing. 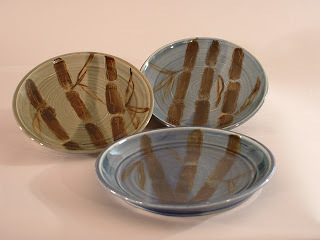 Jim doesn't read my blog so I can safely tell you that I am making him a set of matching dishes for Father's Day. Should be a HUGE surprise, as we eat off my seconds, hardly any of which match. Just purchased a new camera and will have to figure out how to use it. I think I will resort to the manual and peruse it a bit, so it may be bit before I figure out how to get pictures up with it. I did make some great pierced vases, going from tiny to large, so I will use the old one to get a shot of that family of work. Wasn't the rain great yesterday? Got home last night and a bucket had about 2 inches of water in it. The back yard just soaked it up. 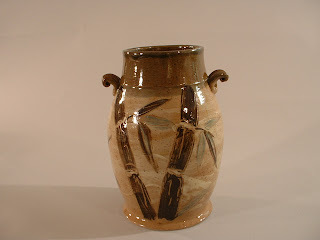 Well, off to cut grass while the rain holds off and then make pots. Today was great. I got to throw some of the dinnerware on my list and finished off with some slab work. I have been wanting to do some sumi-e type drawings with underglazes, so I did a plum branch, some chinese lanterns (plants, not lights) and some wild orchids. 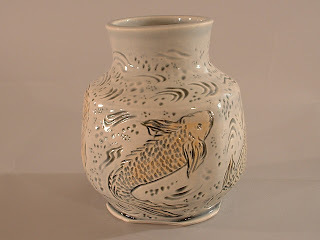 The cone 7 underglaze testing we did earlier in the year was a big help in choosing colors that would look good under a clear glaze, although I am thinking about toning down a light amber glaze with clear to give just a hint of color. I was working with freshly made pieces, so the underglaze went on smoothly instead of dragging like it does across bisque ware. More color went on the walls, as I am having the outside trim painted at the studio. I liked the result, but Jim is not crazy about the color choice. I thought my black shutters would look good with the new trim, but now I'm having second thoughts. May have to check out other swatches tomorrow. 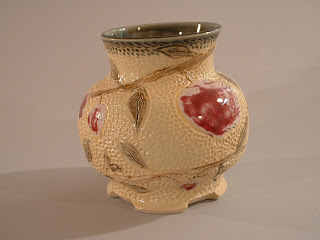 Kiln opening tomorrow with custom pieces and some slip tests using Blackbird, Yellow Ochre, and Red Art. Hope I hit a home run on one of these, as I am getting low on the red/brown slip I have been using for my bamboo pieces. Yesterday I had the privilege of meeting James Soder, of Ambrosia Gallery in Shelby. It turns out he is married to a veterinarian and is a wood-turner. I haven't been by there yet, but intend to drop in when I am next in Shelby. Very conveniently located just off Hwy. 74. They are doing some exciting things in the arts there, which is always great to hear about. Today is chore day--wash the pottery aprons and towels. About once a month I haul them home and clean them up. Afterwards it is really nice to put on a clean apron or grab a fresh towel. Went looking for patterns for aprons yesterday to use up some of the fabric I have collected over the years. Apparently they are back in vogue. Honestly, I have never worn one in the kitchen, and can't imagine donning one of the frilly little things featured in the pattern books. I found an interesting one that tied on the sides--similar to the old smocks you wore in grade school when they let you free with the poster paints and the newsprint. Monday was Spence's 21st birthday. Hard to believe the last child is now officially legal. He had a nice surprise because his friend and fellow songster, Maddie, found a used piano for sale and got contributions, so he now owns a piano, residing in the band studio. Very, very appropriate for the guy who used to rock out on our one at home, amazingly self-taught. Opening a bisque and glaze kiln, and trying to fire again before the next round of thunderstorms. Have a clean apron kind of day! The show in Gaffney turned out ok for me. It was a beautiful day and I had to wear a light jacket most of the time due to the cool breeze. Just a bit of wind during the afternoon, but I had come prepared and had the tent tied and weighted down, and didn't put up high shelving. I came home with some sunburn on the back of my legs and the front of my knees. Go figure! 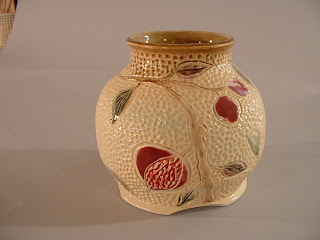 The pottery is sitting in the car, awaiting Monday unpacking. I had the "after the show" syndrome, where I didn't want to face it today. 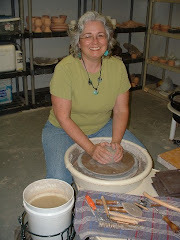 As Scarlet O'Hara used to say, "Tomorrow is another pottery day. I can unpack then. As God is my witness, I will never unpack today!" Some studio shots of new work. 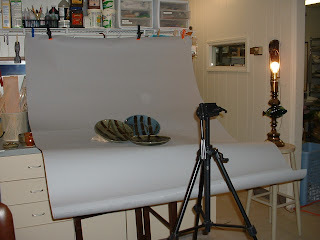 I also included a photo of my camera set up, which is done in the middle of the handbuilding area, using some little spot lights. My camera viewer is tiny, so it's hard to know if things are in focus or not and the camera is always giving me a warning that the lighting is too low for the picture, so I try and steady everything as best I can, let my breath out, then snap the shot before I start breathing again. Sometimes it works ok. Here a pix of me that Alex Miller took during the Barn Sale. Thanks Alex! The weather for the sale turned out nice and there seemed to be a nice crowd out. I did get sunburned on one side because of the layout of the field. 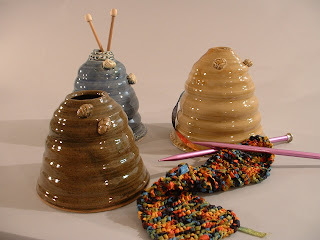 Lots of great comments on the beehives for storing your knitting at home. Thanks to all who came out! On Sunday we drove to Lake Lure to see my family. They have a week at some condominiums there, so I saw my sister and brother-in-law, my mom and dad, and two friends, Jean B. and Jean P. We had a great time and my jaw and cheekbones were sore from laughing so much. At several points the noise level reached critical status as three or four conversations were going on all at once. Spencer, our musician son, had a concert with his band, Tides of Man, in Orlando on Saturday. He said it went well and they had some fans drive over two hours to see them and get their autographs. My comment to Jim was that it was tough to think about Spence having chosen such a hard profession to break into, and what hard work and constant effort he would have to put forth. Jim just looked at me and laughed, and said, "You're one to talk about hard professions!" It's true, pottery probably is one of the more challenging mental and physical art/craft mediums and can wear on your body and mind. But there can be such magic when everything holds together and goes right. I'm just glad Spence is in his twenties and has a lot of stamina, because he is going to need it! I'm off to the studio to unload the boxes and set everything back up in the studio. Here are some photos just fresh in from the studio. 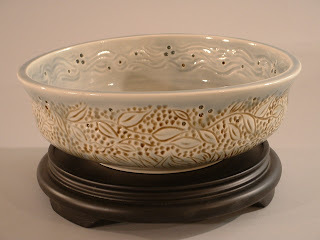 I have been working on special orders from a show in February, and some experimental slip work and getting ready for our ClayMatters show this Saturday in Charlotte. Some of these new pieces will be with me at the show, so hope you can come out and view them in person. A picture is worth a thousand words, but to be able to hold the thing in your hands is infinitely more valuable! New "cloches" for knitting craftspeople to store yarn in while working on projects at home. New slip work on brownstone clay. Using the bamboo theme. Really liked the way the slip worked on the darker clay body. Inspired by wisteria all around me. 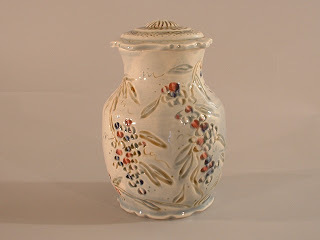 I have made a few more wisteria themed pieces and will glaze them in a similar manner, with some china paint highlights for more vivid color. I do love this piece, though. 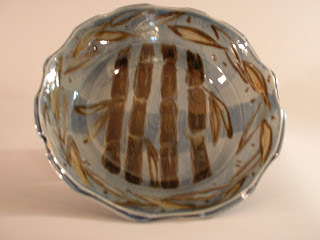 Working on the "pierced" theme, I tried to see how the glaze would look when it covered the open holes. You can't see the effect here, but it is quite nice. I recently began to use this light blue. 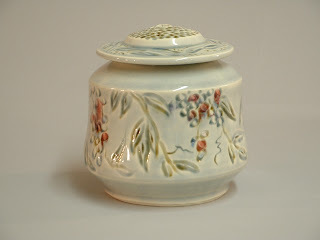 I would like to develop a very soft, light green but that will take some glaze experimention. 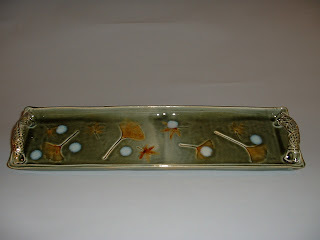 A commissioned wall hanging/platter for Gayle. 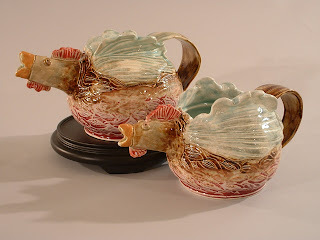 Chicken pitchers-the larger one is for Tonya. I handbuilt the original that these were based on, but decided it would be easier to throw the body of the piece and I was right! 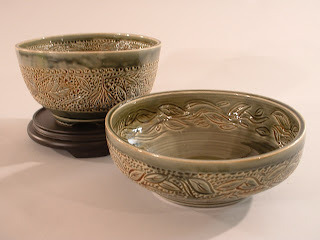 Two different versions of carved leaf bowls for Virginia. There is one more cooling in the kiln, waiting to be glazed. Glad I don't have to chose which one! 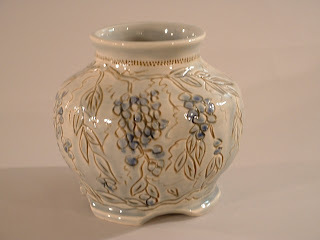 A recreation of a pomegranite vase for Virginia. Another waiting to be fired to choose from. Long tray for Gayle. The color on this really turned out beautifully. Very rich. Wish my studio shots were better, but I am working under limited circumstances and not so great lighting, so the color is not as vibrant as the real objects. 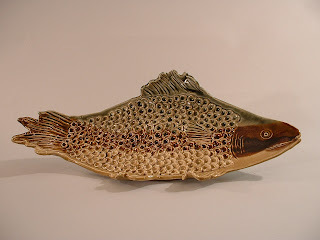 Scaled fish tray for Gayle. Experimental slip work. These just have a clear glaze over them. I am not very pleased because I thought the color would pop more, but it is rather subtle. 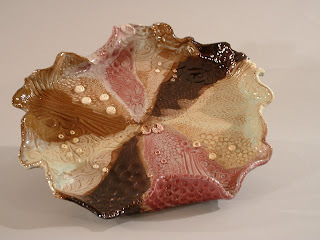 I will try to use a colored transparent glaze over the next ones and see how that works. I have an image of cherry blossoms and orchids that I want to try. Too many ideas and not enough time! 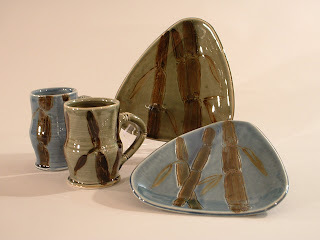 A shot of my bamboo mugs and triangle plates together. They make lovely sandwich and breakfast sets. Ok, so that's it for pictures of work for a bit. I have to get busy and send out an email about the upcoming shows and get the quarterly work done for the veterinary hospital. Think nice weather for Saturday from 7am to 6pm. Then you can let it rain as much as you would like because I will be done with my outdoor show!